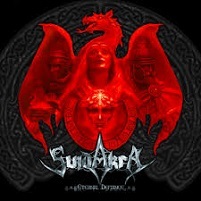 Now two albums deep into the mythos of their Odoric tale, and with an extensive musical discography behind them, Suidakra’s latest release is not what some would expect, given no background information to it. Cimbric Yarns is an entirely acoustic release from the band, something that they’ve long wished to accomplish. Given the deeper conceptual background they’ve been striving for, it seems the perfect jumping off point for a bit of experimentation. Not just some campfire metal songs, but rather a realized story with plenty of other instrumentation to help exude some further emotion, these aren’t simply cheery and happy acoustic tracks. There’s a rich sense of personality that yearns to be unlocked by listening further, even if they don’t pick up the electric guitar. 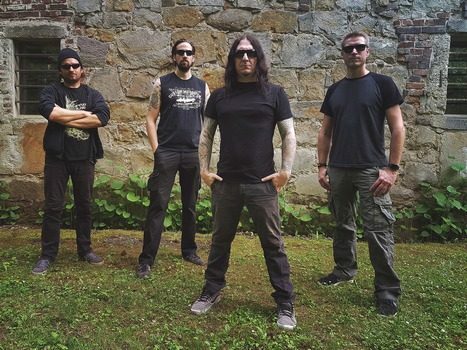 We checked in with guitarist/vocalist Sebastian Jensen to hear his thoughts about the unique release in Suidakra’s catalog, the Odoric concept, and where it will take the band in the future. Dead Rhetoric: What inspired you to take the acoustic route with this album? Sebastian Jensen: We always wanted to do an acoustic album. We’ve thought about it for many years. Since the acoustic set [from 13 Years of Celtic Wartunes] actually. After that, we always had the idea to do an acoustic album, but it never fit because of songwriting and other things. After Realms of Odoric, we felt it was a good time to do it and take the chance. Dead Rhetoric: What were some of the challenges of designing an acoustic release? Jensen: Suidakra has always written metal albums since 1994, and there have been a few acoustic songs on the albums so it wasn’t a big problem. We are used to writing acoustic songs, but not a whole album. The first challenge was to write an album that no one would expect from Suidakra, it wasn’t like picking Suidakra songs since 1994 and putting them in a row. It was something completely new. We also wanted to make an album that wasn’t boring in the end. The last challenge was to write the album itself, since we had never done an acoustic album. All that came with it was quite challenging but a lot of fun. We learned a lot from it and we think the end result is pretty cool. Dead Rhetoric: Any trepidation in completely switching up the formula, even if it was something you had wanted to do for a while? Jensen: Not really, because we always wanted to do it. We were looking forward to it, and it was great fun to write an acoustic album instead of writing metal. It was new and exciting, so we weren’t afraid of doing it. If you are asking about fans and how they would reaction – yeah, we knew we couldn’t make everyone happy, but you can’t do that with a metal album either. There are always people who will say “That’s not the real Suidakra” or “It’s not metal anymore” and things like that, but we weren’t afraid of that, no. Dead Rhetoric: What does the acoustic album allow you to do that other Suidakra albums have not? Jensen: In this case, we took the chance to write over every character. We usually write about stories, not exclusively about characters. With this album, every song is about a character, so that is different. When you write acoustic songs, it gives it a chance to maybe get more feeling in there. The clean vocals, the harmonies, the viola and flute, everything that comes out – maybe a bit better. The whole writing process – if you listen to a metal album, it’s always kind of shredding music. If you do an acoustic album, it has to be recorded precisely. You will hear everything during the recording and writing process, so that was a big change for us as well. Dead Rhetoric: Could you discuss the visuals of Kris Verwimp and how they tie into the last two releases? Jensen: You have to know that there is a side project between Kris and Arkadius which is called Realms of Odoric. They are just doing orchestral/soundtrack stuff, and that’s where the last album, Realms of Odoric came from. As well as the Cimbric Yarns album now, which is the counterpart of The Cimbric Age of their side project. Kris has been around in the band for a while now, you could say he’s a full-time member. He does all of the artwork for the albums, he has been the lyrical concept and background stories for a lot of albums. He also did this for the Cimbric Yarns album. He came up with the lyrical and background story, and he always combines history and fantasy into it. Dead Rhetoric: Has the more cinematic scope of Realms of Odoric become a fertile concept for the band – would you like to take the idea forward with more releases? Jensen: Absolutely. It’s a whole concept – the Realms of Odoric was the start of a whole concept series, and Cimbric Yarns is now a continuation of the story. In total, we have four stories in total, since it’s all coming from the side project Realms of Odoric. They have the first, second, and third age now. The Third Age is coming out now, and the Cimbric Age is between the second and third age. 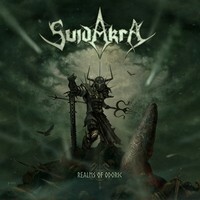 So they have four albums, and we are going to do the same with Suidakra. Again, the first age was Realms of Odoric, we’ve done the Cimbric Yarns, so now there is the second and third age to come. Those will be more of a metal thing to come. Dead Rhetoric: So there’s a loose framework then for what the story would look like? Jensen: That’s a lot to tell! It’s all about Odoric. In the first album, it was about the character Odoric. Now in the Cimbric Age, it tells a bit more of his mother and father, and it continues on. The Cimbric Yarns is about a distance and sophisticated civilization that goes down in a cataclysm, so to speak. Dead Rhetoric: What do you think about doing an acoustic tour? Or perhaps a mix of acoustic and electric? Jensen: We haven’t decided on that yet. We are still in the process of figuring out how to do it. A whole tour would be cool, since it would be totally new for us. But it brings some challenges as well. It’s going to be a surprise. Maybe we could include some songs in a metal set, or maybe just 2-3 gigs where we would go wholly acoustic. It’s going to be surprising [laughs]. Dead Rhetoric: Why do you feel fantasy lends itself so well to heavy metal in general? Jensen: It’s interesting to read – it’s different. It has something in common with humanity, but it’s like watching a movie. You can leave reality with the feelings. That is something interesting as listeners. As musicians, we like to imagine how it was and feel it. I think that’s what the audience likes as well. They want to know how it continues, as well as we do. Dead Rhetoric: What can you say of the band’s continued evolution over time? Jensen: I think there’s been a lot of evolution [laughs], a lot of changes in style. We like to experiment a lot. There’s a lot of influences coming in over the years, and abilities too. You evolve as a musician as well – you want to take a step further with each album. You want to try something new. Arkadius is totally into orchestral stuff at the moment, so he is doing that a lot and includes it into Suidakra as well. We try different instruments. So that’s totally different than the beginning of the band. There’s a lot of evolution and it’s going in a direction that we like. Dead Rhetoric: You left the band at one point. What brought you back? Jensen: I had to leave because I had a lot of work to do. At that time, we were doing a lot of touring and it was hard to include it in my schedule. Nevertheless, I was always in the background, writing and doing some vocals and guitars in the studio but I was not a full-time member anymore. Because of being included, it made it very easy to follow up and be included, and it felt good to come back now. Things have settled, and I just can’t live without music and the guys. It felt right to step in again. Dead Rhetoric: So how would you say that you have grown as a person alongside the band? Jensen: Musically, you evolve a lot during the process. You are getting older, and you are playing more and you experience different things during tours, writing, and studio times. You evolve playing your instrument, and it is a continuous journey. With great musicians around me, it was quite easy to evolve. We have so many talented friends around, people involved in the Cimbric Yarns album as well – doing flutes, viola, and different instruments. All of those creative people help you grow and become better and better every day. It never ends [laughs]. Dead Rhetoric: What’s next for the band in 2019? Jensen: We have some metal shows – the acoustic stuff hasn’t been decided yet. That will be interesting to see. We have already started writing the follow-up to the Cimbric Yarns album, which will be a metal album again. We are writing music for the counterpart for The Second Age, so we will play shows, continue writing, and hopefully hit the studio soon to record the next album.